Like most restaurants these days, the change in seasons signifies a change in the menu at the Blue Hound Kitchen in downtown Phoenix. This is great news for diners, because with each switch comes something even more phenomenal from Chef Stephen Jones. When asked how he comes up with new items the chef replied "I dream about them". This season the new menu at Blue Hound shifts its focus from the meats of winter to the fish and bountiful vegetables of spring. Accept for the Deviled Eggs which have been a staple on the menu since the restaurant fist opened. I was recently invited to sample the new Blue Hound Market spring menu and I'm not lying when I say it wooed me in every way. Our evening started with the seafood crudo. 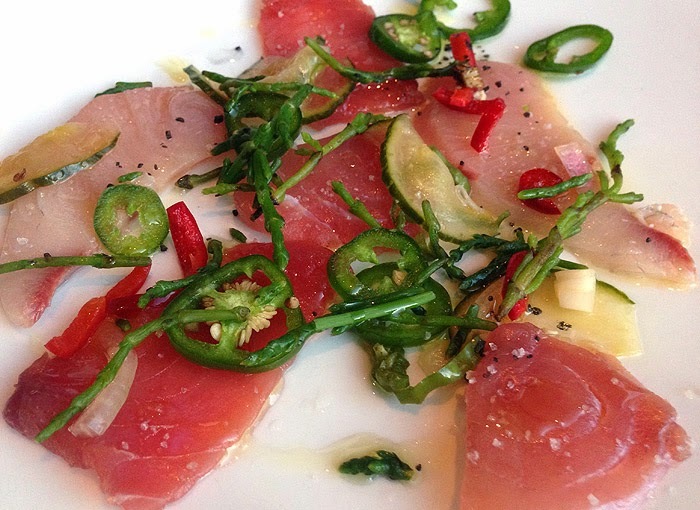 Thin slices of Hamachi, snapper and yellow fin tuna coupled with pickled chilies & cucumbers drizzled with olive oil. Crudo, which means raw in Italian, is certainly an acquired taste. But it didn't take long for my two non-fish eating companions to warm up to this delectable plate of sea fare. 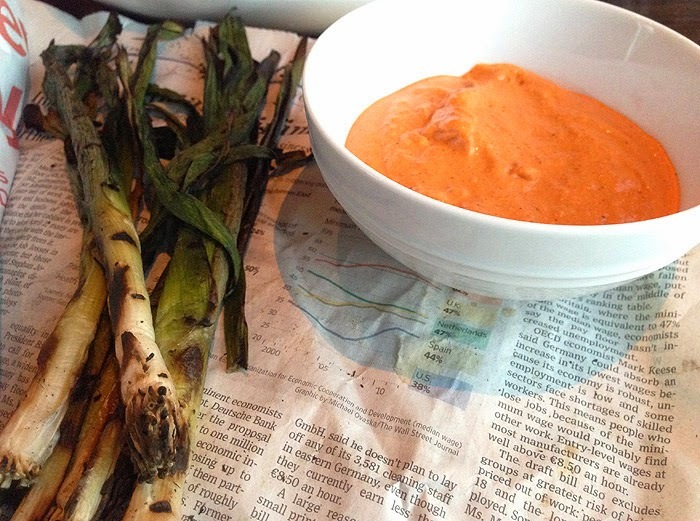 Wrapped in newspaper to keep them warm and soft, the leeks made an interesting presentation. My only caveat with this plate was that there wasn't any bread to swab up the creamy red pepper sauce. 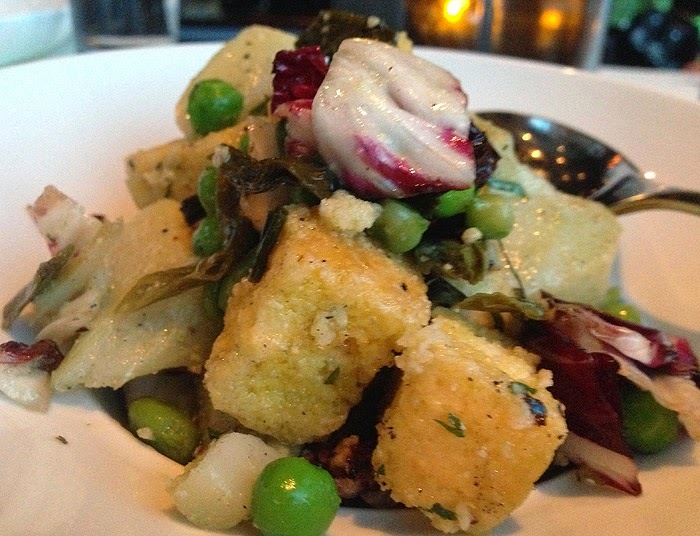 Next we tried Chef Jones interpretation of the Italian panzanella salad; cornbread croutons, artichoke hearts, fava beans and burnt baby leeks all lightly dressed in an herb vinaigrette. 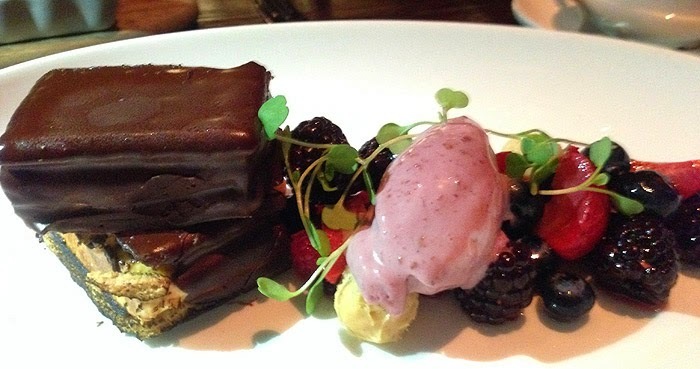 Earthy sweet is how I would describe this dish. If you want to know what spring would look like laid out on a plate just order the cured strawberry and fennel flatbread. 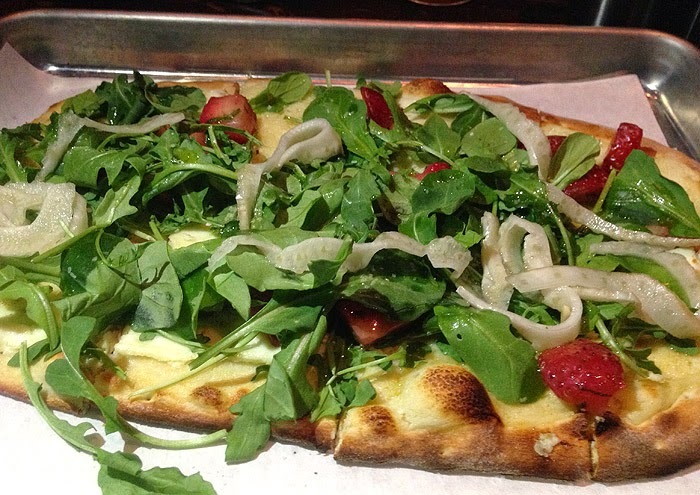 Pickled fennel, wild baby arugula and cured strawberries complement one another to create an interesting sensation in your mouth. Chef Jones describes himself as a "fish junkie" and if by that he means he creates wonderful dishes with fish I'd have to agree. 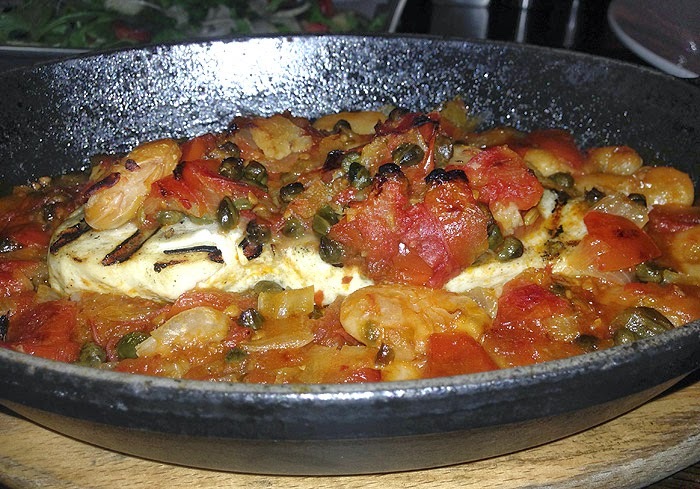 I sampled the swordfish with giant white beans which was braised in a tomato caper sauce. It was delicious. 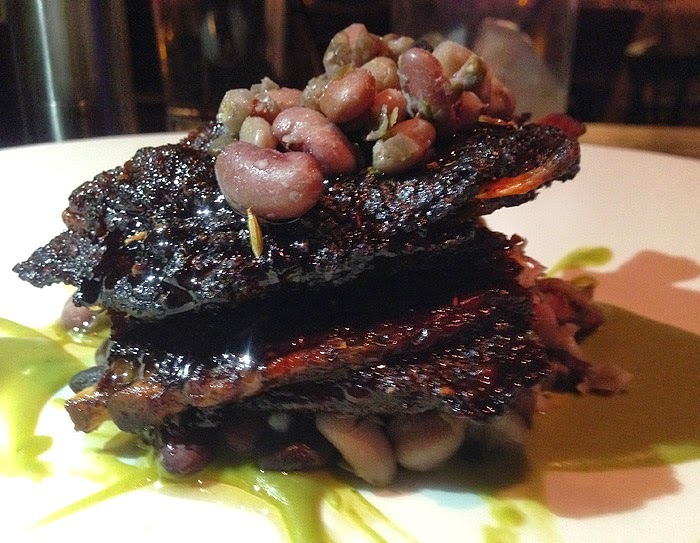 Meat lovers have no fear Blue Hound has you covered with the smoked lamb ribs. They are brined for 36hrs in garlic, citrus and sumac and then rubbed in pink peppercorns prior to smoking. The results...well you'll just have to try them for yourself. Though we were full the Chef had one last thing in store for us. The bhpb&j. Homemade fire seared marshmallow nestled between triple chocolate dipped house made graham crackers served with macerated berried, blackberry jelly ice cream and miniature peanut butter mousse balls...need I say more. Fresh ingredients locally sourced and lots of creative options on the new spring menu at Blue Hound Kitchen. I suggest you get in there and give them a try.